The biggest challenge when planning a travel wardrobe is usually the weather. If you expect mixed weather with temperatures varying from mild and sunny to rainy and cold, you wouldn't want to carry double wardrobe sets of everything and then only use half. Instead you'd be focusing on layering, and on how to make travelling less bulky and heavy. Going to Thailand was one of the few occasions where the weather presented no challenge... we knew it was going to be very warm at all times, so no provisions for cooler temperatures were needed. The challenge lay elsewhere... since we'd booked an island vacation and a city break, the wardrobe pieces I would bring along would have to work in both environments. As this was our first trip to Thailand, I couldn't rely on previous experiences for what to wear. So it was even more important that all wardrobe pieces could be dressed up or down, and adapt to the atmosphere of the destination. I hope you enjoy the pictures of our island vacation on Koh Samui. Most were taken in the beautiful Belmond Napasai resort where we stayed.. it is a picture book paradise you never want to leave! To get the maximum out of a travel wardrobe, the individual items should work together as much as possible. A skirt or pair of trousers for example should be compatible with many different tops. The same goes for accessories and shoes; there is not much point bringing a pair of shoes that would only go with one particular wardrobe item, or a necklace that goes with just one top. A mix of well-matched, simple and dressier clothes, shoes and accessories will be perfect ingredients to create numerous different looks which can be dressed up or down, and also go from day to night: A simple, bohemian style necklace, straw bag and flat thong sandals can turn a more elaborate robe into a sweet daytime sundress, whereas strappy sandals, sparkling earrings and a clutch transform it in a second into something more glamorous for the evening. 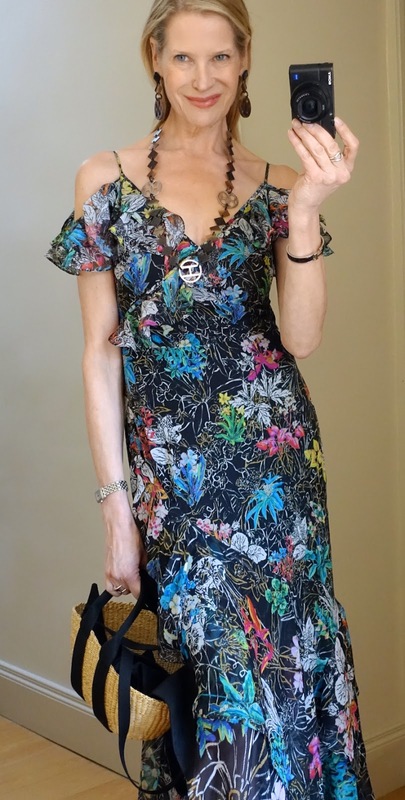 This floral dress below is one of those I've had forever, and it was fun to style it with the pretty new items I found for the collection: The Duo necklace set and teardrop earrings (available here) make it look fresh and current again. I took quite a few bags on this trip, but since they were light weight and stackable straw bags (George and the new Mini George) and small evening bags (a Kelly Pochette and a Zara clutch) the weight and bulk wasn't so different from taking a leather bag. The Belmond Napasai's accommodation consists of individual villas dotted about in the lush tropical grounds, or on the ocean front, making your stay completely private and very relaxing. 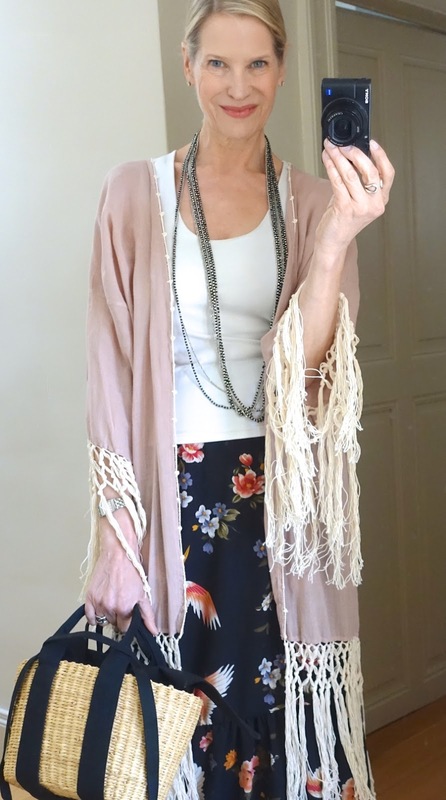 This silk chiffon kaftan is another wonderful item I found in Bangkok, and since I had an empty suitcase with me, I brought a few more back which will become available in the shop soon. Here accessorized with the new silver tassel and multistrand necklace set (available here), three strand earrings in silver (here) and a Quadriges Hermes printed enamel bracelet. If you read my previous post on Bangkok you probably know how important decoration is in Thailand, and how skillfully even the humblest things are turned into something beautiful and extraordinary. It must have taken more than an hour to turn the shallow, water-filled bowl into this magnificent bougainvillia petal arrangement. I was so happy to see how well the new teardrop earrings (available here) go with the Double Anneau necklace in noir/or (here) Also wearing: narrow Hermes Caleche enamel bracelet in black with GHW, kaftan by Roberto Cavalli and clutch by Zara. On our first night we strolled into the restaurant at around 8h30 pm, only to find it completely empty. We quickly learned that pre-dinner drinks were best taken at around 6h30, the most magical part of the day. From then on we had early dinners with everyone else, followed by a wonderful breakfast the next day and perhaps some fruit, if anything, for lunch. The resort was too relaxing to leave and the food wonderful, but if you want to venture out, head for the 'Relax @ Samui' beach club.. I spotted these colorful lanterns hanging above their outside dining tables when we were driving past, and it was definitely worthwhile coming back for a simple and lovely dinner in a romantic setting. If only one could make time stand still. 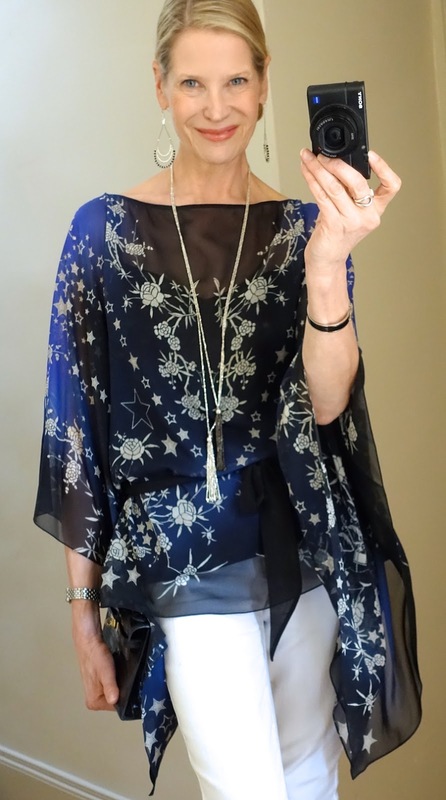 Kaftan as before, accessorized for a beach dinner with a Double Anneau necklace in noir/argent (available here) Hermes Clic H bracelet in black and a Mini George bag. Earrings by Chanel. 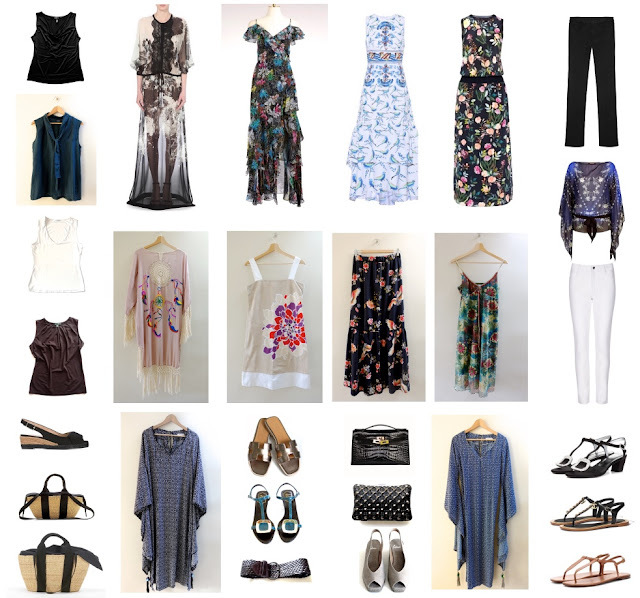 Coming next: Adapting the travel wardrobe to a city break in Bangkok! The full length floral dresses are so chic feminine! And what a beautiful setting in which to wear them! Thanks so much Kackie! I just fell in love with the dresses, looking so much forward to wearing them again in the summer. 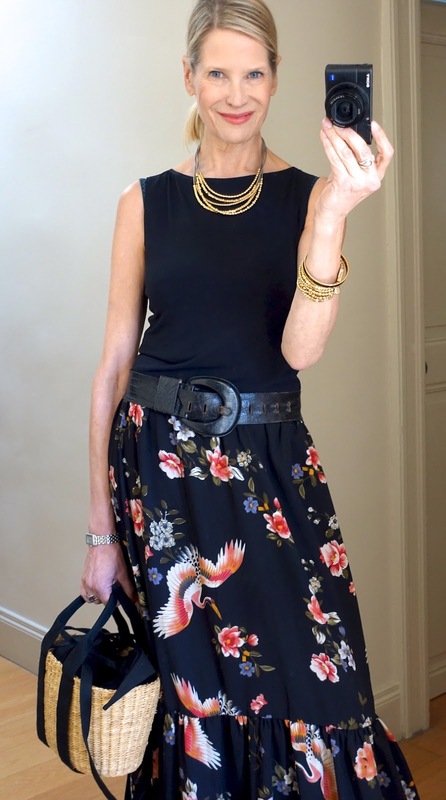 Beautiful Mrs D-both the choice of wardrobe and you ( aging with such grace and a wonderful inspiration to us all)! thank you for sharing the pictures and memories of your wonderful holidays! As always, you look picture-perfect! Looking forward to the next part of your Thailand memories. Still trying to catch my breath....I'm gasping! So much beauty - yourself, nature, the travel wardrobe you selected and your new items in the shop...wow! You wear each and every one of them with so much grace and the lush green or blue backdrop is just icing on the cake. 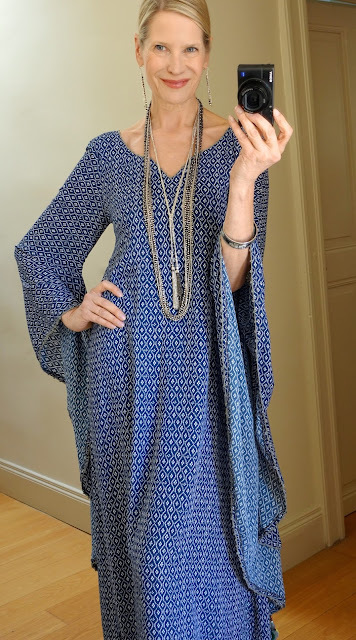 The Peter Pilotti dresses (a brand I wasn't familiar with) are one of a kind.. and of course I had to look them up - just to find that you look a lot better in them and present them so much more elegantly than they do in the online shop! You can sell things, bravo. Thank God spring has arrived or I would have been green with envy because of the blue sky, sunshine and warm (well, hot is more precise) temperatures. Can't wait to see how you turned everything in city outfits. Thanks for sharing these inspirational pictures! Love all these outfits; that Peter Pilotto frock espesh fab! Thanks so much. Love the PP dresses too, they are so creative! Beautiful setting, beautiful YOU and perfect wardrobe for a beach resort holiday! It will be fun seeing how you adapt it for the city, especially the shoes! Congrats on the fun new items in the shop. You wear them well! Merci, très chère Myriam. J'adore la tunique aussi. En plus c'était une belle achat (moins de 150 Euros, à La Roca Village, près de Barcelone). Bises et bon fin du weekend. My earlier comment seems to disappear..., I admire you style and the harmony with nature your outfits, and especially the accessories create. Rushed to order a mini-Caba before they sold out. Wishing you and the Swans a wonderful spring !